Northumberland Football Association has appointed John Ackerley as its new Chief Executive Officer. With over 17 years of experience working in leadership in the sports sector, Ackerley takes over the role after previously working for the Football Association as regional manager for the national game. He has outlined his main priority as providing the highest quality service possible to existing and future stakeholders in the county FA. John said: “Delivering excellence for all involved in football in Northumberland is my main aim. I want everyone engaging with us to have an excellent experience. 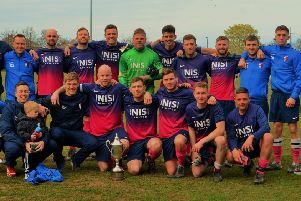 “Northumberland is an area full of passionate football people, and I believe it is the most prominent sport in the region. “There is so much potential in the wider community and within this organisation, which attracted me to this role. Ackerley was among the first football development officers in the country in 2000, and he has been involved in extending the reach of the game ever since. After creating a complete football development team at the Cheshire FA, he was tasked with helping other county FAs to improve their strategies in a senior role with the FA. Alongside his business credentials, John previously worked as a coach with the FA’s national partially-sighted team and has fulfilled multiple other coaching roles. He’s also a qualified coach educator and still plays regularly, giving him plenty of experience to draw from in his new position. Due to his enthusiasm for the sport, ensuring there are opportunities within football for all is another key focus for the new CEO. Ackerley said: “Inclusiveness and equality is incredibly important. I’m really focused on increasing opportunities for everyone in Northumberland. Ackerley replaces former referee Clive Oliver following his resignation in October. Mark Woodhall had served as acting chief executive in the meantime.